Tile lasers are essential for ensuring that the first tile that you lay down is set correctly. Tile lasers makes it easy to improve the visibility and accuracy of your tiling and also removes the necessity of having to use chalk or string lines when you are installing flooring. 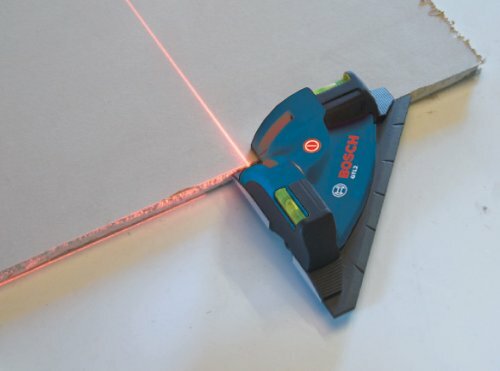 The way tile lasers work, is that they will produce a clear laser line that becomes immediately visible on work surfaces and in front of the tool itself (Source). Some like the Bosch GTL3 Professional tile laser capable of switching to 45 degree lines to ensure that square tiles are properly and exactly positioned between 0 and 90°. Whether you are looking to install a new surface like hardwood flooring, brick, carpet, stone or tile, a tiling laser level can help you do so accurately without the annoyance of messy chalk lines. Let's take a look at five of the best-selling tile/flooring, laser levels on the market today and see how they compare. This 2.6 pound, Bosch GTL3 Professional Tile Laser is a great laser precision guide for tiling and flooring with a raised laser that will go over uneven areas. Users love how accurate the Bosch Tile Laser is and how bright the laser is for a decent distance though it seems to be harder to see outdoors in direct sunlight. The GTL3 is both water and dust proof and has a magnetic attachment to help it stay on the positioning plate. Many users talk about how much this helped them out on the job and one buyer mentioned that during a four hundred plus square foot tile job they thought the laser was not strong enough. But after playing with the Bosch for a few minutes while on the tile they were able to get it to work just fine. They compared the lines they made themselves to the ones using the laser and it was within ⅛+- of their lines. They went on to say that it was most likely their lines that had been off by a little. Another customer that enjoyed the tile laser had one con they brought up- that it has about a 45 minute time saver, where it will shut off after about 45 minutes of use. Some user were not happy with the strength of the laser saying that it was hard to see after about six feet or in the sun. This tile laser is an efficient option if you make a living tiling, or even have a few floors that you want to work on. This 3 lb. 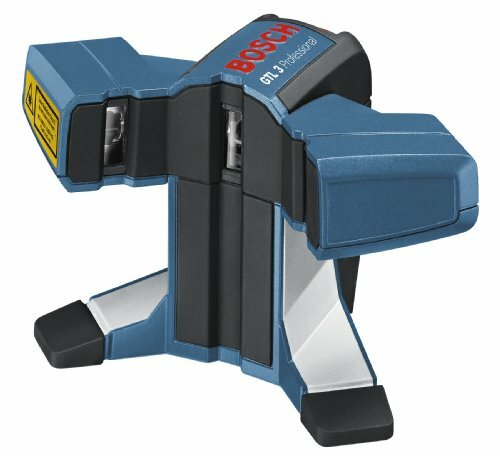 Bosch GTL2 Laser Square is a great laser guide for a 90-degree layout with a simple one-button operation. Users love that the brightness of the laser is easy to see and is accurate but it is hard to keep it in place. The GTL2 comes with two adhesive strips and is supposed to be accurate up to thirty feet. One customer said about the Laser Square that their wife wanted them to finish a mirror project on their wall, they said the laser brightness and length were excellent and the Bosch sticks to the drywall perfectly. This reviewer had a little difference in opinion as far as the adhesive goes said that it has some sticky tack on the back, but questioned how long that would last. They also said that it makes using the laser guide harder because it doesn’t sit flat against the wall. A few customers had a problem with the laser saying that it was either out of focus and hard to read. This laser guide is an inexpensive option if you have projects to do and want to save a little money. This 7.2 ounce, XCSOURCE® Right Angle 90 degree Vertical Horizontal Laser Line Projection Square Level Laser Square BI010 is a great laser guide and level with Dual diodes for making 90-degree laser beams on any surfaces. Users love how easy and accurate this guide is but the suction cups don’t seem to be the best. Multiple buyers of the XCSOURCE are quilters and they really seem to like it and said that it works great for them. One of the buyers mentioned that the XCSOURCE is great for quilting, and made the process take a third of the time. While another quilter said they have been quilting for over forty years and this lightweight laser guide is a tremendous time saver. They went on to say that while working with the material it can move around a bit, but with the laser guide, it keeps everything lined up and straight. The vertical horizontal laser seems to be used more by quilters and sewers then many others. This right angle laser line projection is a very cheap option for those who are working on little projects like quilting and sewing and so on but it doesn’t seem like it has much other use. 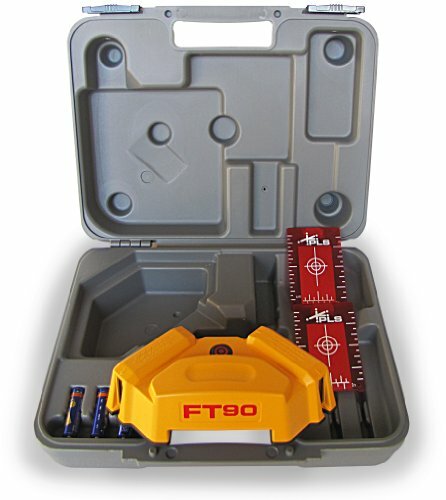 This 4.1 pound, PLS Laser PLS-60567 PLS FT 90 Floor Tile Layout Tool is a good laser guide with a Working range: +/-65-Feet and a Square accuracy: +/-1/16-Inch at 20-Feet. Users love how much time the PLS saves them when it comes to making cuts in the tile and with only a few reviews I have not seen anyone have a complaint about it. The PLS Laser comes with a three-year warranty and a carrying case for lugging it around. One user had a problem with it after a couple of years but said that when they called the manufacturer they asked them to send it back, when they got the package back to their surprise instead of the old one being refurbished they sent them a brand new one. Another purchaser said how the Tile Layout Tool helps them out a lot being a solo tile installer, and that the accuracy saves them a lot of time and money. This laser guide is an expensive option but if you are looking for a high-end laser guide this one should help out with whatever projects you might have. 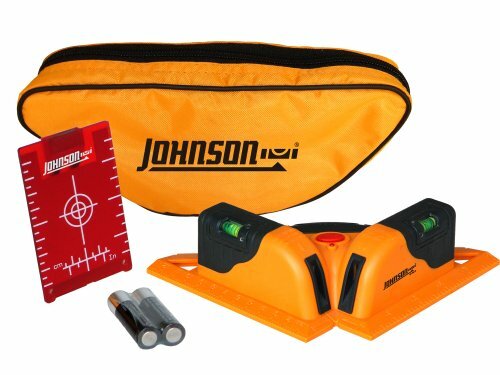 This 0.2 ounce, Johnson Level and Tool 40-6616 Tiling/Flooring Laser Level is a nice laser guide that projects two laser beams over wet mastic or concrete and angles are easily established with the built-in protractor. Users love how much more they are able to get done in the same amount of time as before but some say that the laser is not as strong as they would like, with one reviewer saying it only went about ten feet. The Johnson Level and Tool does take batteries which are included. One happy reviewer mentioned that you can get rid of your chalk lines because the laser guide is much more useful. They went on to say how straight the lines are and how you don’t have to worry about losing your chalk lines. While this unhappy customer mentioned that they were unable to get a perpendicular line on the wall. They tried to place blocks of equal thickness against the wall to clear the threshold but it still didn’t work. This laser guide is a good mid ranged tool for anyone that is looking for something that should help speed up work as far as tiling goes. 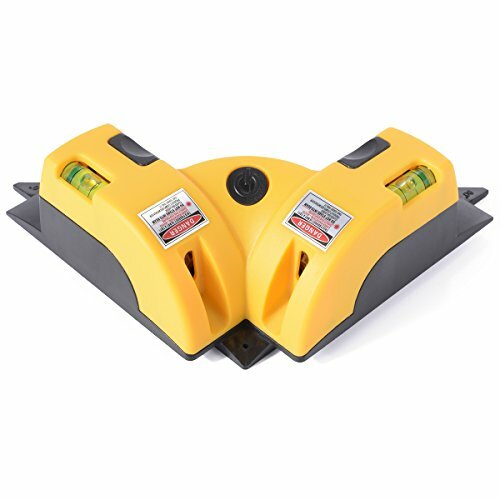 If you are looking to purchase a tile-floor laser level, review our comparison table top of the page, examine the different product reviews, and also check out the individual product pages where you can find other consumers who have purchased tile laser levels and see what they're saying about their experience. Most users are pleasantly surprised at how easy and functional these devices are to use, writing that they are a necessity for any tiling job-counting then as time savers and great value buys. One user has described to us how he used his tile laser level in conjunction with a measuring tape so that he was able to lay out a grid that exactly approportioned every piece of tile for his bathroom floor. In addition, it allowed him to conduct some intricate measurements so that he could accurately cut around plumbing as well as doorway entrances and sharp corners- this would've been difficult to accomplish if he had been using chalk lines. Another user writes of doing a large-scale tiling job and purchasing one on a lark just to see how well it worked. He ended up conducting an assessment, comparing how accurate and straight his Bosch model's lines were in comparison with the chalk lines that he traditionally used. 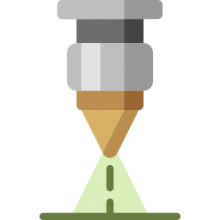 He discovered a 1/7"+ or - discrepancy between the two and his assessment was that it was most likely that his chalk lines were crooked and that the tool was in the right. Indeed, most users are highly satisfied with their purchases- saying that they have made a large tiling jobs much easier to do, ensuring that tiling is even and straight, which makes any layout job much more simple to accomplish.